These added ingredients give additional support to your horse's existing diet, to help keep them calm in stressful situations. 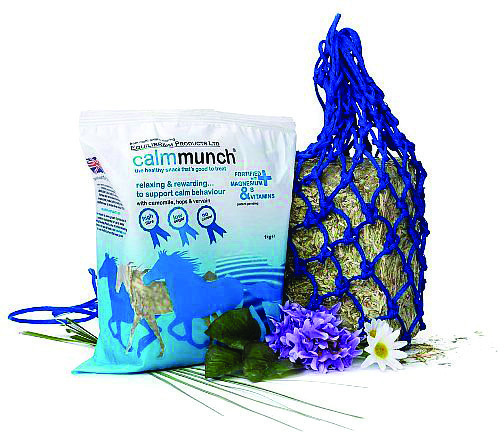 As Calmmunch is high in fibre, but low in sugar, with no cereal, it can even be fed to overweight or laminitis prone horses & ponies. The Calmmunch blocks are sealed in an airtight bag, within 48hours of the Timothy Grass being cut. This maintains ultimate freshness for your horse. The 1 kg blocks are ideal to feed as a snack anytime, anywhere: in the stable; in the field; whilst travelling or at a competition. As they are compressed, they take longer to eat than normal hay, so they can be great at entertaining bored horses. They can be fed dry, wet or in a net. Equilibrium Munch Nets are also available & they have been specifically designed to feed Calmmunch blocks. All Equilibrium products are Beta NOPS accredited & made in the UK.